Crazy to think I have my own Geek SLP app on iTunes ( Free app) and I have never posted about it on my blog!! I guess I have been kinda busy ( with my iPad 2). The app is just in reality an extension of this blog; it allows speech therapists or parents to access my posts organized in a iPad style, making it easier to access all my content in one place. My app is web-based; what that means is that you will not be able to access my posts if you are not online. The reason is because the app is pulling the information from my blog database. 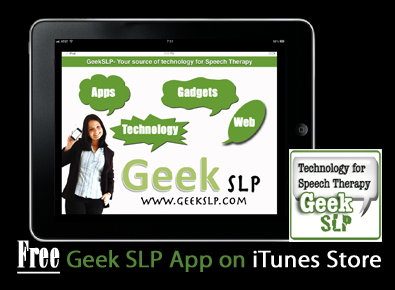 The Geek SLP app also have easy to access links to my Geek List of Apps for Speech Pathologists and also a link to my Facebook Page and Twitter. -which apps do you use? -let me show one I like and it was Free. Well, this friend of mine did not know I had a “Geek SLP” App. I thought it was cool that someone had the GeekSLP app. In fact I am impressed with the number of people downloading the app on a daily basis. The app has been downloaded by nearly 2 thousand people. I have even had downloads from Saudi Arabia and Pakistan. I wonder how they knew about Geek SLP. Hi, my name is Anne and I’m also a Geek SLP (Everyone say “Hi Anne”). While I’m not the only SLP in our district to use technology and computers in tx, I believe I’m the only one with an iPad. I’m pretty sure I’m the only one who got only 4 hours of sleep the night she got her new iPad : ) The number of available is apps is overwhelming, however, and I’m looking forward to your blog entries and app suggestions to help me get oriented with this new tool/toy.